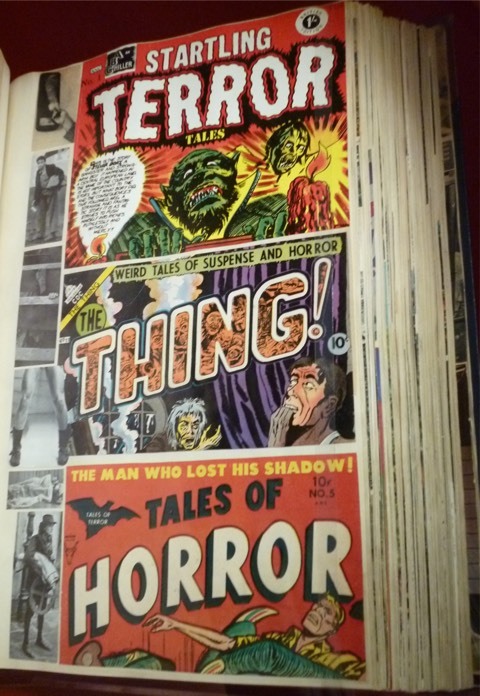 Here is my interview with Dr. Laurence Grove, the co-curator of an exhibition exploring how comics have been constantly reinvented. From Egyptian hieroglyphics to Frank Quitely’s originals, the multi-themed Comic Invention mixes ancient and modern, fine art and comics art, Scottish and international, to make four exhibitions in one. 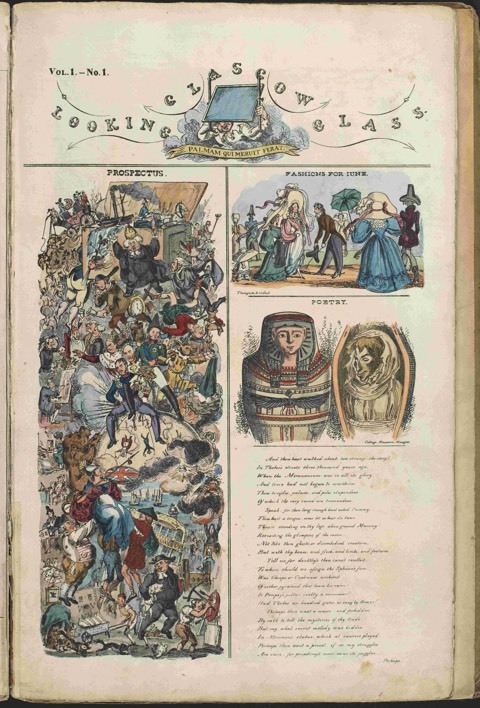 This is also represented in the enlightening catalogue, or more accurately four catalogues plus a reproduction of part of the first issue of The Glasgow Looking Glass of 1825, all housed inside an elegant box (below). This landmark exhibition runs from March 18th to July 17th 2016 at the Hunterian Art Gallery in Glasgow. 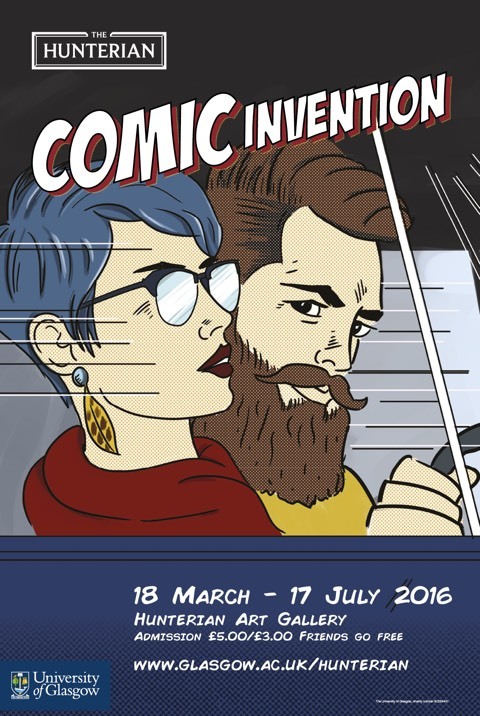 As co-curator with Peter Black of Comic Invention, what are your main goals for this exhibition? That the geeks will come out saying, ‘Hey dude, this old stuff is cool’, and that the stuffy academics will come out saying, ‘Hmm, this Frank Quitely chap, with his comics lark, does actually have a modicum of talent’. 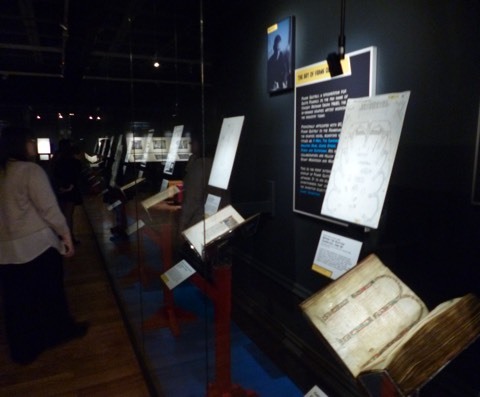 The exhibition (and the box-set that goes with it), like a comic, is open-ended. Each visitor will approach it in their own way, making their own associations, coming to their own final conclusions that hopefully ‘think outside the box’. 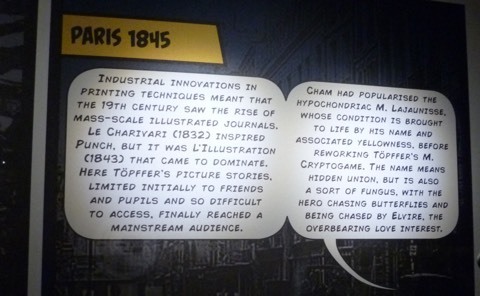 You are the character in the colourful story that is Comic Invention. And how you handle the exhibition creates your individual experience. 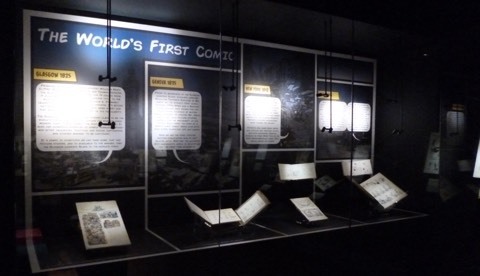 How do you decide when and where comics were ‘invented’? It is a trick question, as ambiguous as the hybrid text/image high art/low art form itself. Any answer depends of course on definitions, and, moreover, on definitions that are those of comics as we see them today, not of the cultural form whose surrounding values were those of a different era. 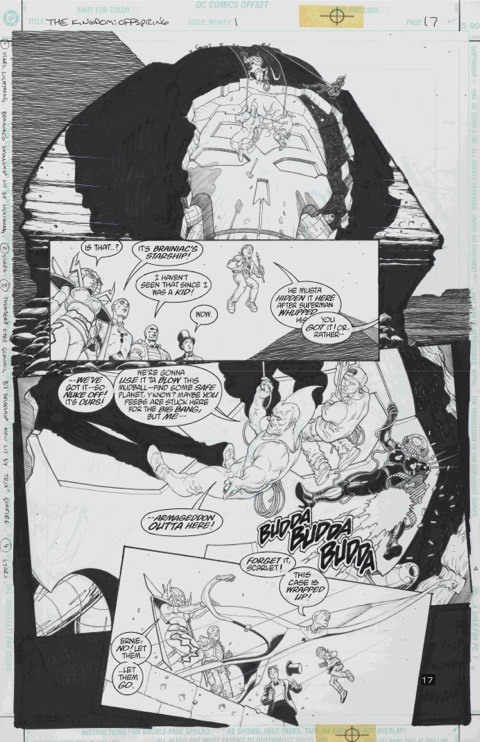 But it is by asking the question that certain central issues come to the fore, namely the fact that text/image narrative and its reception saw a turning point with the mass technology of the nineteenth century, and that today’s culture is one that increasingly reflects upon and indeed reflects the culture of comics and comics as culture. We give one answer to this question—Glasgow, 1825—and then tell you it’s not as simple as that. 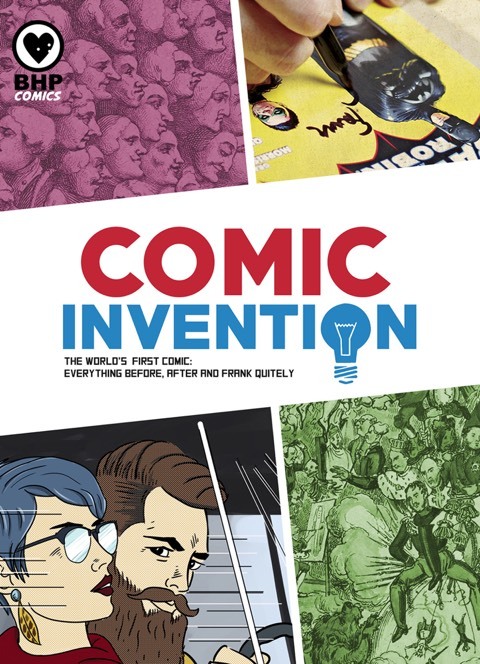 In Comic Invention we show how the themes of the past match those of today, that you cannot separate high art from low art, and that every picture tells a story- although not always the story that was intended. Above all you will discover that the culture of comics is all around us and the invention is still ongoing. Looking at the print evolution of comics worldwide, how important have Scottish creators and publishers been? Another trick question! On one very tartan level, comics owe everything to Scotland: Scotland invented comics (The Glasgow Looking Glass, 1825), developed them (The Dandy, 1937), produced the world’s cultural hub for text/image cultures (Glasgow), and is now home to three out of four of the world’s most dynamic creators of graphic novel art: Mark Millar, Grant Morrison, and Frank Quitely, who all live in Glasgow. On the other hand, comics depend on the receiver. Each reader creates their own adventure by applying the texts and images before them to their own experiences. So for different people there will be different key moments in comics. That is also how the exhibition works. Audiences in Scotland can relate, in their own way, to Roy Lichtenstein or Andy Warhol, just as readers in Los Angeles can enjoy Frank Quitely’s rendition of Batman in a kilt. What made you choose to show mainly original artworks by Frank Quitely to represent contemporary comics? 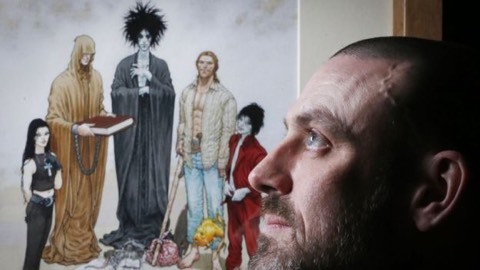 Frank Quitely is a pillar of DC, and as such is the perfect figurehead for mainstream contemporary comics through titles such as X-Men, The Sandman, The Walking Dead, Judge Dredd, Batman and Robin and Superman. He has been referred to by the BBC as ‘one of the most in-demand artists working in the industry today’, and yet no one can deny his inventiveness and finesse. But by the fact that he is born and bred and continues to live and work in Glasgow Frank Quitely also links the past—The Glasgow Looking Glass—with the present. 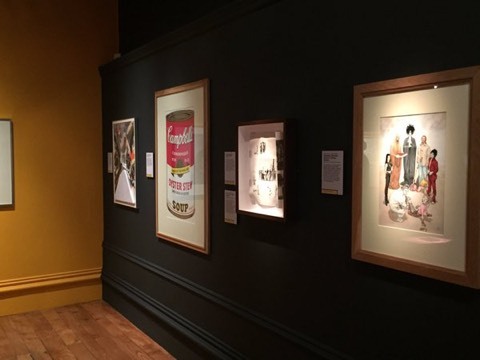 This exhibition is the first extensive public display of Frank Quitely’s original artwork. 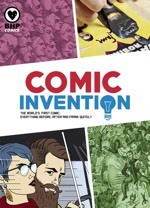 It is his eclectic inventiveness that links together the inventive eclecticism of Comic Invention. How are you relating the many historical examples in the exhibition with Quitely’s modern comic-book originals? 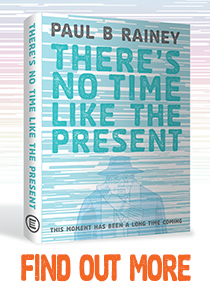 Thematically, so that connections can be made between the developments of the past and the expression of the present. So a 16th-century metamorphosis from an illustrated Ovid goes well with a metamorphosis from the X-Men. Some medieval bed-hopping fits in with elements of Frank Quietly’s eroticism. Or a funeral slab from Ancient Egypt sits next to a story from The Kingdom: Offspring with the sphinx as centrepiece (below). But my favourite is Abraham the God-figure from Wenceslas Hollar’s 17th-century re-working of the Bible being echoed by the ascendant glory of Superman. 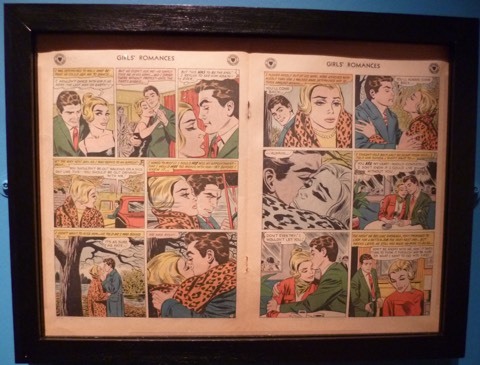 You are also showing plenty of comics-related fine art, from the familiar Warhol and Lichtenstein to less well-known artists. What ideas and debates do you want to raise by doing this? 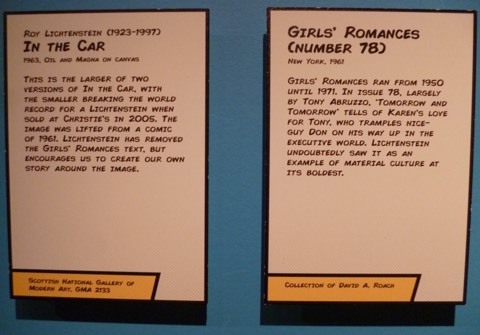 When Roy Lichtenstein uses a panel from a Girls’ Romances comic book to create a painting, In The Car, is it art? What if Sha Nazir turns it into Glasgow hipsters for an exhibition poster? 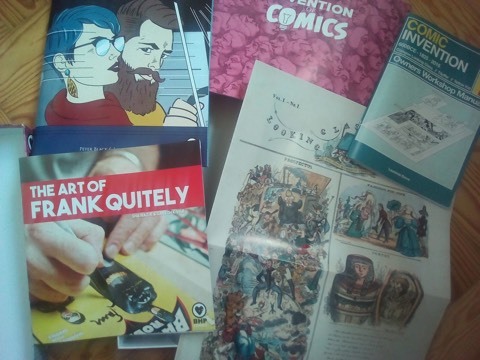 Comics are palimpsests—multiple layerings—of the surrounding culture, and the culture around us—advertising, Instagram and tabloids—increasingly reflects the text/image ethos of comics. ? In short, do artists make comics or do comics make artists? High Art and Low Art: can we differentiate these if Picasso draws a strip, or if Frank Quitely is framed on a gallery wall? 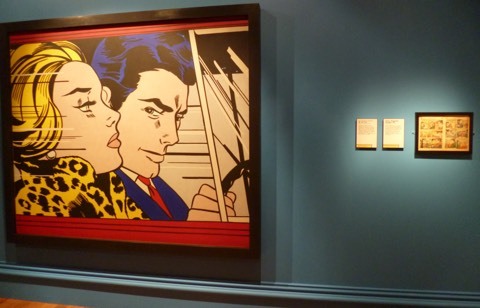 Pop Art: the movement that made the everyday into art, including comics. 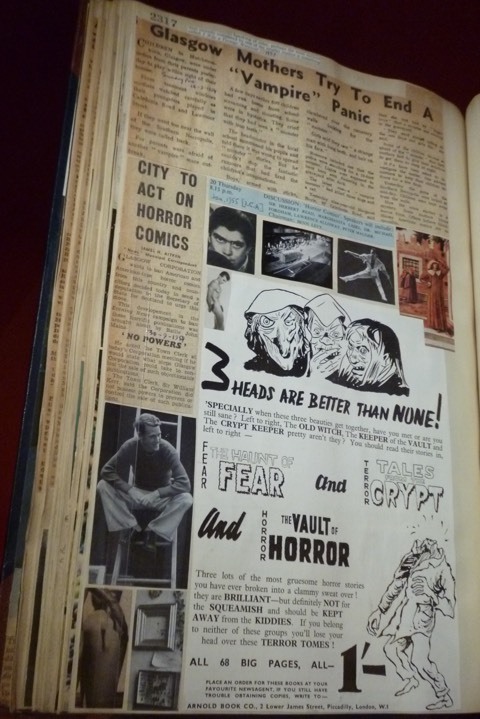 Horror Comics: not all comics are funny, but they can be socially relevant [see local scrapbook pages below]. 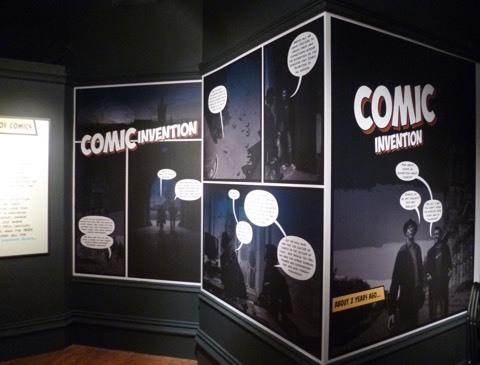 How does the exhibition address the contributions of women to the ‘invention’ of comics? We felt it was important not to deny or distort the gender imbalance of the past in this field. 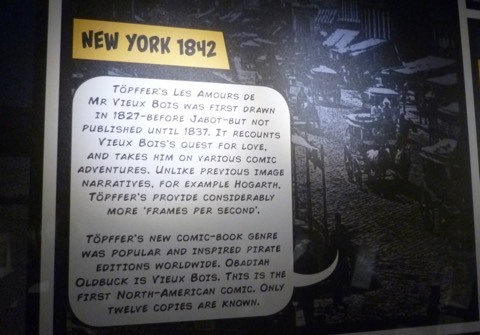 However the exhibition is very much about looking forward, and enjoying the culture of comics that is all around us. We want the experience to be all-encompassing, and the visitor to see comic invention as they walk down Byres Road and beyond. To that end, as the visitor leaves the building the key object, with the exhibition’s fullest label, is Christine Borland’s To Be Set and Sown in the Garden. This work amalgamates different elements, and elevates the everyday to the status of art. Overall it represents the basic precept of Comic Invention, namely that each visitor creates their own narrative experience, and that this experience should stay with you beyond the walls of the Hunterian. It was important for us that it should be a contemporary female artist leading the way forward. For a quick addendum, you might also notice that in the lead image, the updating of In the Car to Two Hipsters in the Car, as well as the change in grooming, it is now the woman who is driving. What were the unique or special circumstances in Glasgow that made it possible for The Glasgow Looking Glass to start and take off there? 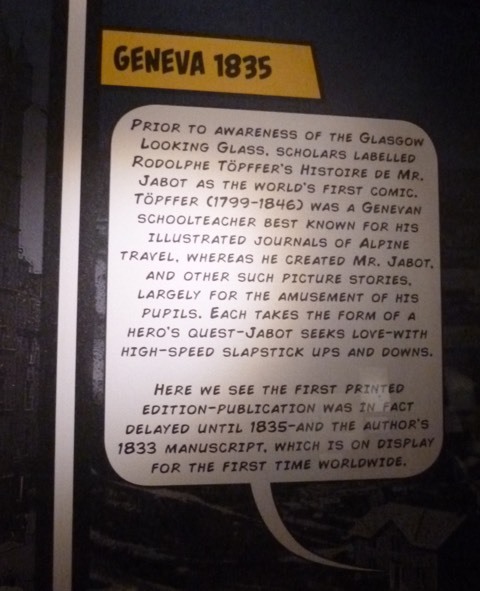 So why Glasgow, as producer of the world’s first comic, home to the montage mind of Edwin Morgan, and now mecca for Turner Prize-winning cross genre compositions and the to-be place for Comic Invention? 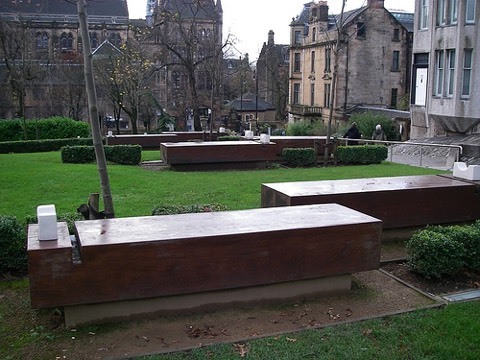 My personal answer would be that, as an international trading port since the late seventeenth century, Glasgow is a montage city, a cosmopolitan hybrid, full of contrasts that come together to create an imaginative whole that is often beyond imagination. It is a city with a working-class industrial base, but also with a mercantile, professional and cultural elite supporting national opera, ballet and theatre, and a world-class ancient University. It thrives on every kind of low culture that Bourdieu could imagine — football, pubs, heavy music and banter (the patter) — yet nurtures a broad-based education system admired worldwide, and produces exquisite art from Mackintosh to Morrison. It is a place that has the vibrant narrative of the Second City of the Empire, yet also the picturesque stand-still imagery of surrounding lochs, islands and mountains. 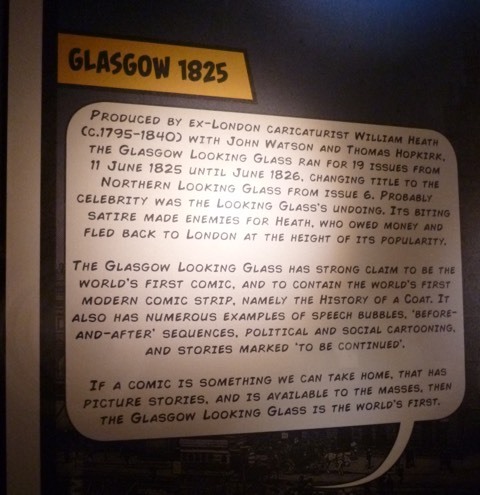 In practical terms, for the birth of comics in 1825, Glasgow’s status as a blossoming industrial centre with its associated social trappings made it an obvious location for popular satire that used the latest lithographic know-how. And finally, how has the exhibition been received? What have been the reactions from the public? The exhibition was a bit of a gamble, but it seems that people have ‘got it’, and it has been wonderfully to see visitors engaging so fully. An edited version of this interview appeared in Comic Heroes Magazine No. 27, April 2016.